I’m an impatient man, so although I heard rumors that Mobistar might be testing the HTC Hero update (which is Belgium-specific, as the YouTube application has to be removed because of privacy law concerns), I decided to go the “less official” way and root and flash the darn thing myself. The process was pretty easy (thanks for the info Thomas & Serge), the outcome is great; my phone is a better Hero for it! Root your HTC: by using flashrec.apk to flash a new recovery image on your HTC as described here. If you get a “backup failed” error in step 10 as I did, you just need to power off and on and try again (the backup itself isn’t used anyway, that step is just needed to have flashrec allow you to continue). 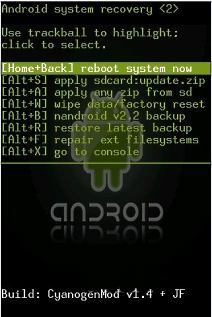 Upgrade your rooted HTC: from the new recovery image menu flash MoDaCo custom ROM v2.x (I installed 2.2, 2.3 was released a couple of hours ago) to your system as described here. And don’t forget to wipe before flashing as I did. Update to the latest radio package to version 63.18.55.06EU_6.35.06.18 from the recovery image menu (you should know the drill by this step) for optimal radio performance. This entry was posted in android, howto, lang:en, linux, Technology and tagged htc hero, mobistar, rom, update on 22 September 2009 by frank.